Megableu is the paradise of games for kids. There are fun kids games for every taste! At Megableu we are experts in finding the best and funniest games for kids. These games for children will excite anyone! Play at home, outside, and even at parties, this is the list with the best children’s games around. Who will the Creepy Hand point at? Megableu’s Creepy Hand is a unique experience of ‘truth or dare’! The Hand is put on the table and everyone sits around. The Hand moves around and points randomly at one player. 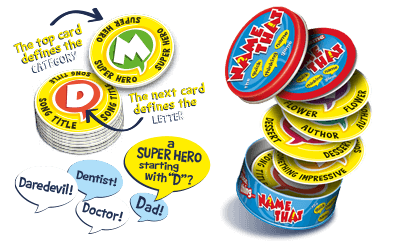 The player has then to pick a card and choose whether to answer with truth or dare. If they fail to complete the challenge, then they have to do another forfeit. Loads of creepy fun for all the family! 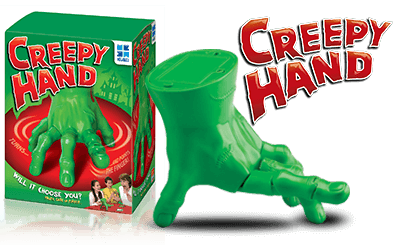 Who will survive the Creepy Hand? Name That, if you can! Name That is Megableu’s most loved board game. Are you smart enough to join this challenge? Take a card from the pile and look at the category and the letter then read it out. You have to be the fastest to find an answer that begins with that letter to win the card. The player with the most cards wins the game at the end. So many possible answers, so little time! Do you have what it takes to be the smartest and fastest person? 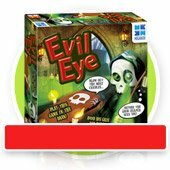 Ghost Hunt Evolution is on everyone’s list! Did you ever want to star in Ghostbusters? This is your chance! 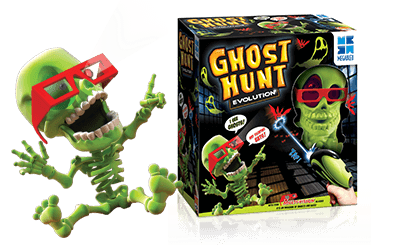 Ghost Hunt Evolution is the most thrilling and funny game. Become a ghost hunter and put on your Multi-Vision glasses and take your laser gun. Billy Bones helps you spot the ghosts and the bats flying around in your dark room. Blast them all off and win points. Bats can fly faster than ghosts and they are worth more points. Compete your friends and score the best!